Initially any issues arising in our area where dealt with by South Lathom Residents Association SLRA in the absence of a parish council. This important community group still exists and details can be seen under Community Groups. The two groups work together to protect the area. SLRA has advantages in that it can take actions a parish council cannot do, like campaigning, and it can respond quickly to planning issues as it does not have to wait for formal meetings. However a residents association does not have the powers of a parish council, the strength of a Parish Council is that it is recognised as the basic layer of local government. It can raise funds through the parish precept and it has the option to exercise certain powers for the benefit of the whole community. It can apply to the district council for capital grants, (which they did for funding for the notice-boards and village signs). Importantly it must be consulted about planning matters in its area. Lathom South Parish Council was founded to use those powers to protect our Green Belt and the identity of Lathom. This will be reflected in all our comments on planning matters. We will seek to protect the Green Belt and, using planning terms, protect the "the openness" of the Green Belt. See below re the draft development plan for all of the Firswood Road Development. The main access to the Firswood Road developmentsite should be taken off Neverstitch Road betweenOld Engine Lane and the Ormskirk Road roundabout, at a point where maximum visibilitycan be achieved. A minor secondary access to the site may be located on the southern part of Firswood Road. Instead of being developed in a complementary way with access at Neverstitch Road Bellway have been allowed to "cherry pick" a part of the site and use the "minor secondary access" for almost a hundred houses. Now we have another developer wishing to add yet even more houses to this access using the excuse of "temporary access" until another developer picks up the costs of the proper access. This application goes against the concept that was approved by the Council and is totally unacceptable to residents of our parish. The latest news on the new proposed local plan will be updated here. 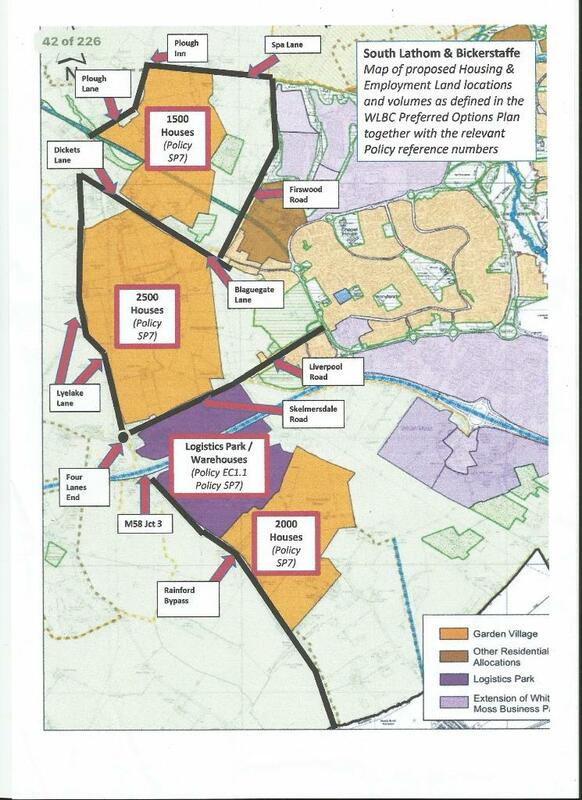 WLBC have announced that the options referred to below are to be reviewed and less Green Belt will be taken to build houses but they will not give details of the changes stating "The Council has still to complete its review of the comments"
Local Plan “Preferred Options” Consultation. There has been a hostile reaction to the proposals for employment and housing development land contained in this document. Since such developments would change completely the character of this Parish and a large part of Bickerstaffe Parish, such a reaction was highly predictable but the Borough Council has chosen to plough on, regardless. The Borough’s planners are putting forward tired old proposals, dating back at least to the turn of the cen-tury, for regenerating Skelmersdale. Again they want to develop large warehouses and “executive” housing. The town remains a “regeneration priority area” be-cause this approach has failed. We think that it has escaped the notice of planners and (Labour) politicians alike that warehouses are undergo-ing massive automation and that locating development in unsustainable locations close to, but not part of, Skelmersdale is more likely to increase commuting by car to Manchester, Liverpool and Warrington than to improve Skelmersdale. The Infrastructure Delivery Plan, which is one of the Council’s base supporting documents, does not even consider major development in the areas proposed. Moreover, they do not even come into the settlement hierarchy which formed the basis of the Sustainability Study. It seems that the protection of best and most versatile farmland and the Green Belt would be sacrificed on the altar of an economic gamble which includes the relocation of thousands of Merseyside residents to West Lancashire. The very long plan period, coupled with excessive forecasts of need, is at the root of the problem. This situation is self-inflicted because this is supposed to be a “Review” of the current Local Plan, not a completely new Local Plan lasting thirty years. There will be at least six General Elections and five more Local Plan Reviews before 2050!. It is claimed by the proponents of this approach that it will lead to greater certainty but it will not. A major problem with the council’s approach is that local plans have a ratchet effect, so anything approved under this new plan – it is not a review – will lead to more and more land being allocated for development. All it will do, if adopted therefore, is set a minimum number of houses and warehouses to be developed by 2050. It will set off a race among developers to get the most profitable sites and develop them as soon as possible, without any time constraints. It is no accident that the plan makes no provision for infrastructure improvements. The planners and their political bosses want to leave such questions to “masterplans” and Supplementary Planning Documents (SPDs). However, that would leave the provision, or non-provision, of essential facilities to the planners themselves and whichever political party happens to be in power at the time – a kind of “pig in a poke”. The last local plan was for this Parish a mixed result, with some success in maintaining the Green Belt status of land owned by Edge Hill which the Council had proposed to release and with no further threat being posed to the 200 acres of Green Belt land between Spa Lane and Vale Lane. However, the proposed development of around 400 houses on land off Firswood Road has been allowed (with special mention of a Planning Brief giving due regard to the linear park and to green space around Slate Lane). The overall result for the Borough is that more than 4,800 houses have to be built over the plan period (2012 to 2027) and around 75 hectares of new sites have to be provided for employment purposes. Many of the houses will be built on Green Belt land, mainly in Burscough and Ormskirk but also in Halsall. To the East of the Borough, large greenfield sites will be developed at Whalleys and Upholland and, disappointingly for this Parish, on land stretching (west to east) from Firswood Road to Neverstitch Road and (south to north) from the northern rear of Blaguegate Lane to Slate Lane. The Borough Council draft development brief for the Firswood Road Development. The proposal involved a development of “at least” 400 homes, with two ‘secondary’ accesses to Firswood Road. One would be from Old Engine Lane and the other would be from a point near the bridge, about opposite Evans’ farm entrance. The ‘primary’ access would be from Neverstitch Road into Old Engine Lane. There are massive implications for local traffic flows, road safety and crime and the Council has not explained how it would ensure that the primary access would actually be from/to Neverstitch Road. Anyone familiar with the Neverstitch Road end of Old Engine Lane would share our concern, we believe, about the impact on Old Engine Cottages. The Borough Council’s planning policy team produced a draft revised development brief which was considered by different committees in June and July. This draft has not yet been approved for publication and so it could be revised further. One of the factors is that the officers seem to have taken note of several comments made in response to the initial version and Old Engine Lane is no longer regarded as the point of entry from Neverstitch Road or as a potential “secondary access” from Firswood Road. Disappointingly, in their eagerness to see development begin, they now seem wedded to the idea that a start will be made in the South West corner, with access either from Firswood Road or, less likely, from the Hooters site on Blaguegate Lane – which the landowners would have to acquire. The landowners in question own only this part of the site, plus the old railway line up to Firswood Road (or proposed linear park - which is the subject of some vague words in the brief) and a small area of land adjacent to the old railway line. They have broken away from the Consortium which had made great play of togetherness in evidence to the Local Plan Inspector. The Borough Council thus took a significant risk of partial development taking place, with the accompanying risk that important components of its plans will not be delivered and this is what happened. Planning permission for a development by Bellway Homes of 94 houses was finally granted by West Lancs. Council’s Planning Committee in June, after being deferred twice. The traffic impact on Firswood Road was deemed to be acceptable after a reversal by Lancashire County Council of important aspects of its original advice. The Borough Council (WLBC) will receive a Community Infrastructure Levy (CIL) of just under £1 million, of which the Parish Council will receive 15% to invest in local infrastructure. WLBC will expect to receive a New Homes Bonus payment of over £6,000, for every house built, from the Government. Only 12 “affordable” houses will be built, there will be no purpose-built housing for elderly people and no market-priced bungalows. There will be no direct link for pedestrians and cyclists to local amenities, all of which will have to be accessed via Firswood Road. A pumped drainage system will be constructed under Firswood Road and Blaguegate Lane and (for technical reasons) this will serve only the new houses.